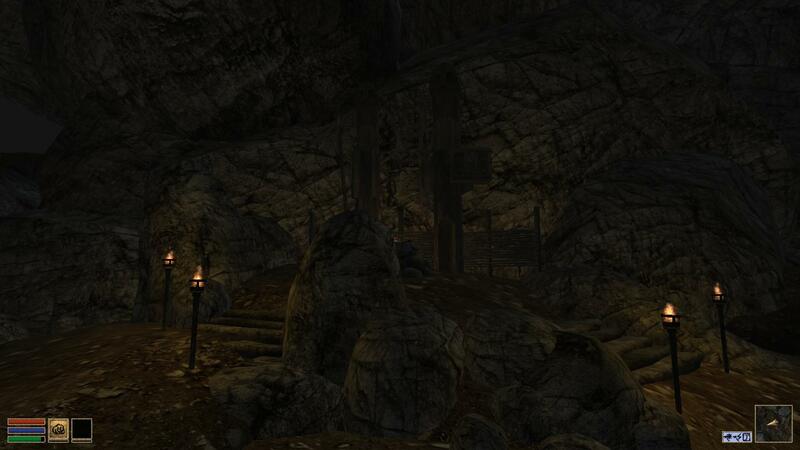 A cavern right within the hidden Reachmen village at -109, 6. 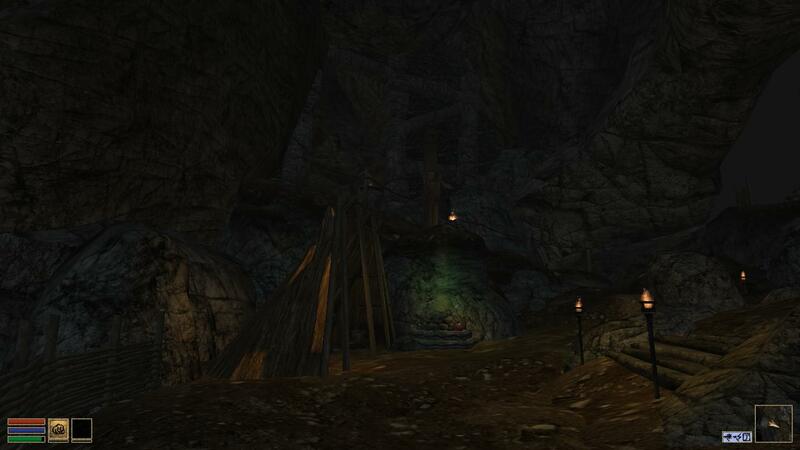 It probably acts as sacred place for the Reachmen and should use a mixture of cave- and barrow assets. Have at it. I'm sure it's going to turn out greatly. I'm not really sure what this should lead to... Burial site seems too cheap, and just another step in the "Reachmen as Ashlanders"-direction. Ideas? At some point I intended it to lead to an "underworld" where a shamanic witch figure would send the player on a quest to defeat his or hers demons. A trial going through a number of confusing and twisted cells, fighting demons and solving riddles, eventually returning to the real world with some attribute boost or a new spell. But it might be too much work right now. The idea of a testing chamber is not that bad, really. I also like the scenery on your screenshot. 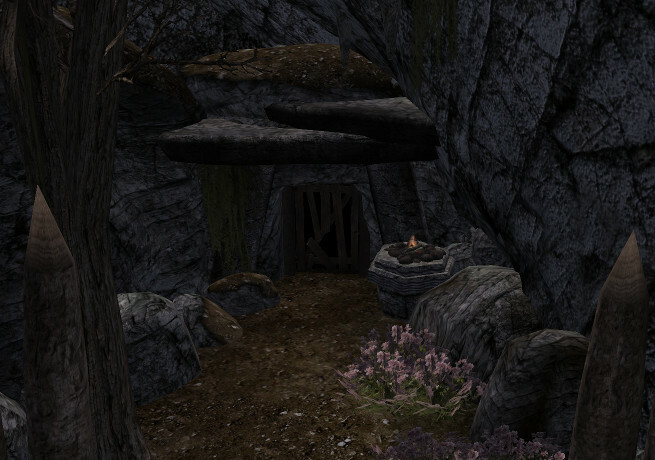 It would be possible to use your current cave as an introduction part to a quest dungeon that is not yet accessible but may be added along with the respective quest later. Those purple censers are inspired. I second worsas' suggestion -- a psychotropic adventure inside a Reachmen cave of testing would be a great way to emphasise their hedge-magickery. That's awesome, I like where you're heading with this one. 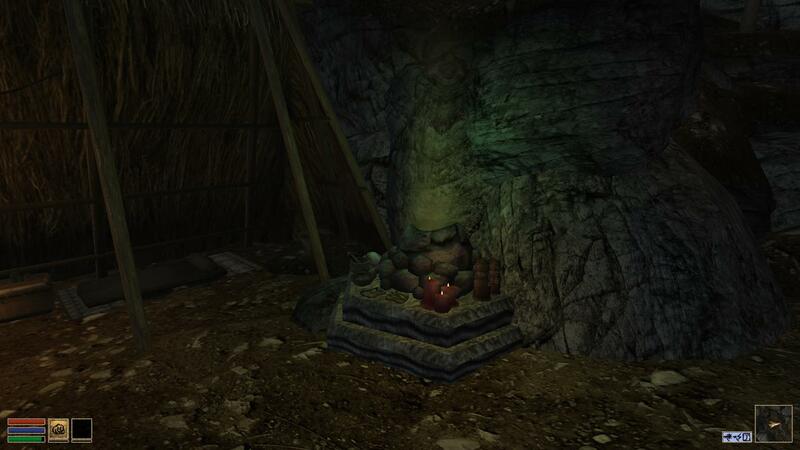 It brings back memories of sneaking through this Pagan village from Thief 2. I'd actually follow this vibe and add there some trees and birds, but then I have this small fixation for groves. Remember to add some water here, there is a grotto just above this cave on Braig Cnoss and Karth's massive root just below. Dropping this, if anyone wants to finish it. I'll pick this up. I've filled in the blanks in the existing cell and am creating a barrow cell as we speak. Lighting: Changed 0 0 0 fog to 30 30 30. Northmarker: Set but not right orientation. Fixed. Illegal to sleep: Yes. Good. Texafornian merged this into Sky_Main.